One of the most influential people of 20th century, Mahatma (“the great-souled one”) Gandhi was born as Mohandas Karamchand Gandhi on October 2, 1869 in Porbandar, India. He led the struggle for India’s independence from Great Britain and became world-renowned for his philosophy of passive resistance. Like many of those who espouse peace over violence, he was murdered by a gun-wielding maniac. When Gandhi was 19, he moved to London to study law at the Inner Temple. He returned to India four years later and started a law practice in Bombay, but it was unsuccessful. An Indian law firm offered Mohandas a position in South Africa, so he, his wife Kasturbai and their children left India. They remained in South Africa for almost 20 years. Gandhi was deeply upset by the discrimination he faced as an Indian in South Africa. When he wouldn’t give up his seat to a European passenger, he was beaten by a white stage-coach driver. He was ejected out of a first-class train compartment during a journey to Pretoria. This trip was a turning point in Gandhi’s life. Soon after, he began teaching the philosophy of satyagraha, or passive resistance, as a way to non-violently challenge authority through mass civil disobedience. 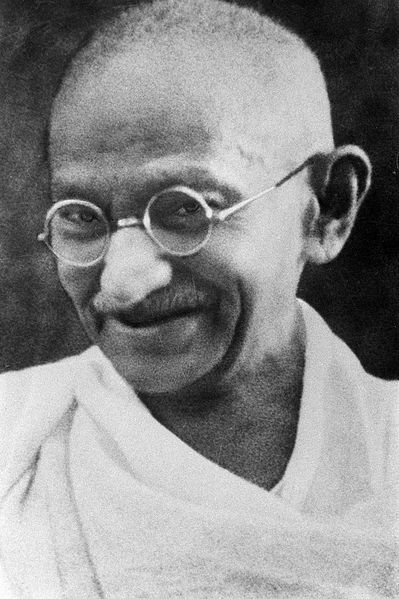 Starting in 1906, Gandhi led an eight-year campaign of civil disobedience. Finally in 1913, the South African government bowed to the pressure from Britain and India and accepted a compromise that Gandhi had helped negotiate, which included concessions that vastly improved life for Indians in South Africa. In July 1914, Gandhi returned home to India. He supported British involvement in World War I but remained critical of colonial policies he believed were unfair. He joined the National Congress movement, and by 1920 he was one of the party’s most visible and effective leaders. As part of his non-violent plan to thwart British rule in India, Gandhi advocated the use of khaddar, or Indian homespun cloth, instead of buying imported textiles from Great Britain. This had the two-fold benefit of helping to boost local economies in India while undermining British interests. Gandhi was instrumental in organizing boycotts against British manufacturers, companies, institutions and any other entities representing British dominance in India. But after numerous bouts of violence erupted, he decided to end the resistance movement, hoping to encourage calm. Even so, the British government tried and convicted Gandhi of sedition in 1922. He was sentenced to six years in prison but was released after serving just two. For the next couple of years, Gandhi avoided entering the political arena until the British government introduced a new tax on salt in 1930, which would have a devastating effect on India’s poorest citizens. By the mid-1930s, Gandhi had retired not only from politics in general, but also from the INC so he could concentrate on working within the rural communities of India. Only World War II was enough incentive to bring him back to the National Congress. He told Britain that India would be happy to support the war effort as soon as Britain withdrew from India. Britain’s response was to imprison the entire INC, setting a new low for Anglo/Indian relations. Finally, Britain, the Congress Party, and the Muslim League sat down to begin negotiations pertaining to Indian home rule once the Labor Party took power in Britain in 1947. Britain granted India its independence later that year, but there was a catch – the country was split into two dominions: India and Pakistan. Gandhi was against Partition, but had high hopes that once independence was a done deal Hindus and Muslims would be able to achieve peace of their own volition. Massive riots followed Partition, and Gandhi underwent another hunger strike, urging peace between these two groups. In January 1948, Gandhi was fasting again trying to bring order to Delhi. There was a failed attempt on his life on January 20th, but on January 30th Mahatma Gandhi was shot and killed by Hindu extremist Nathuram Godse, who was angered by Gandhi’s attempts to negotiate peace between Hindus and Muslims. When Gandhi’s body was carried for cremation next to the Jumna River the following day, roughly one million people made up the funeral procession. 20 Fascinating Facts About Martin Luther King Jr.